4 years of rugged use, drops, submerged- repaired, heavy gaming, endured desert heat and cold, still running well. But lot of dents and cracks. Upgrading from note-3 to other phone is tough, nothing seems better. Anonymous, 13 Sep 2018The Galaxy note 3 equipped with haut gamme cpu (qualcom snapdragon or exynos) and have 3gb ram... moreHave also been using it for 4 years now. Not a single issue. Wanted to upgrade today but the latest 2018 models does not even come close to this phone. Will just replace the battery and use it until it finally gives in or Samsung stop doing updates for it. The Galaxy note 3 equipped with haut gamme cpu (qualcom snapdragon or exynos) and have 3gb ram and a resolution of 1080p with 5.7 screen .... it's perfectly praticable phone after 5 years ! Why I'm not able to back up my contacts on Kies 3?each time I try to back up my Note 3 to my laptop it back up all except contacts, even there is no contacts icon on Kies at phone part.. I love my Note3 which i purchased in April 2014 and until now still working, just refresh from time to time or do a factory resetting with auto backup to restore your important files. Anonymous, 18 Jun 2016Honestly the note 3 is the greatest phone i have ever had with 4g connection i have used this ... moreWhat is the type / series of your galaxy note 3? Because I also have Note 3 with SM-N900 Series,but it doesn't support on 4G LTE, so I wanna know, is it just my phone or it depends on its series? Anonymous, 10 Jan 2016note 3 or e7 (samsung) what is better? 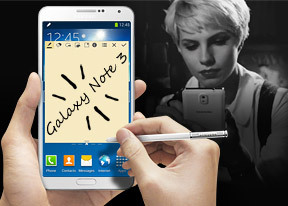 ?The Note 3 is equipped in a much richer way and has also a stylus and multitasking. Not outdated after three years. Worst company that I've ever have dealt with. My one of the expensive phones was dead just after 5 months of purchase. The service center took the phone from me for repair and kept with them for 2 months and even after that my phone is not working, They are not even ready to co operate with me by any way. My phone is even running out of warranty, no compensation no solution at all. Please do not prefer Samsung Mobile phones 3rd class services. May i know why some Note 3's don't show the model number on reboot? Samsung is best phone I've ever had and recommended to All family and friends and even strangers !!! I like note 3 , it's perfect so far there is no big difference between the latest mobiles.